Talking about something real. How refreshing. In an election cycle so far consumed largely by Trumpisms, an email scandal and lots of polls to nowhere, The Guardian reached out to 22 major presidential candidates for their opinion on an actual, living, breathing issue. 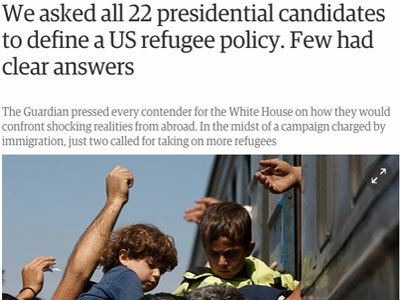 Specifically, The Guardian sought comment on the Syrian refugee crisis, asking candidates whether they believed the US should take in more refugees and what type of policy toward asylum seekers they would set if elected. Of those who responded to the question of taking in refugees–Hillary Clinton, Bernie Sanders, Jeb Bush and Marco Rubio were among those who did not–Democratic contender Martin O’Malley was the only one who “said unequivocally that the US should take in more refugees and put forward a specific number.” That number was 65,000. “If Germany–a country with one-fourth our population–can accept 800,000 refugees this year, certainly we–the nation of immigrants and refugees–can do more,” he said in a statement to the Guardian. Read Sabrina Siddiqui‘s full piece for responses from other candidates. Reading this piece reminded us how refreshing are the alternatives to standard election coverage protocol. How much richer content could be produced, how much more of a public service could political journalists offer if we spent more time comparing candidate positions on the issues rather than candidates’ positions in the polls? Siddiqui gives us just one example of what election coverage could be if we reject horse-race mode.